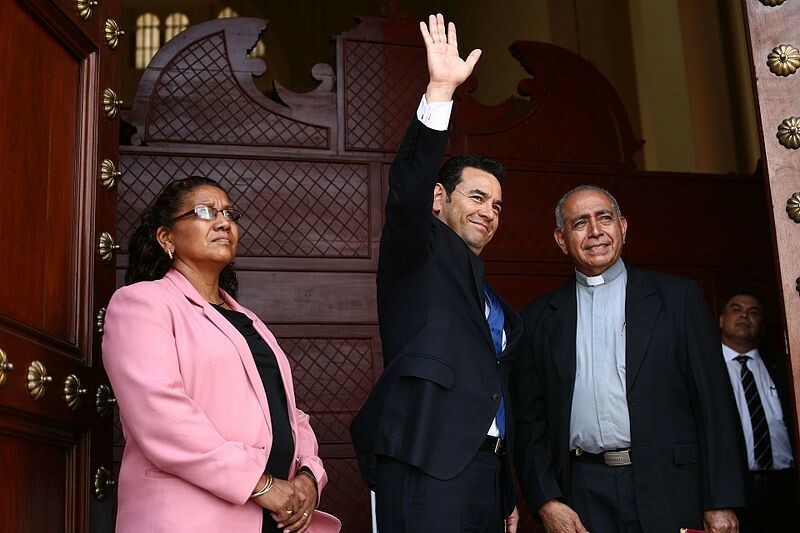 Members of the Guatemalan Congress ruled in a sweeping vote on Monday, September 11, against the request from the CICIG to lift President Jimmy Morales’s immunity amid allegations of corruption and illegal campaign financing in the 2015 election. This vote, a huge victory for the President, comes just hours after recommendations from a congressional commission to fulfill the request to withdraw this immunity to allow for further investigation into these illegal finances. The President has denied any wrongdoing in the matter. The request to strip Morales of his immunity was made on August 25 by Iván Velásquez and Thelma Aldana, head prosecutors of the UN-backed International Commission against Impunity in Guatemala (CICIG), after the emergence of new evidence that the president may have been the recipient of nearly $825,000 of unreported and illegal campaign finances. Less than 48 hours after Velásquez and Aldana made this request to Guatemala’s Constitutional Court, Morales announced the expulsion of Iván Velásquez himself, sparking domestic and international outrage and disapproval. Velásquez has been the Head Commissioner for the CICIG since October 2013, and is widely respected and supported by the U.N. and other international bodies for his mission to crack down on corruption in Guatemala. The United Nations and Guatemala together created the CICIG in 2006 as an independent anti-corruption panel in order to combat organized crime and to strengthen the country’s judicial institutions. The CICIG emerged out of the country’s desperate need for a strong rule of law following a long history of conflict, instability and corruption. Since its creation, the panel has been considerably successful in investigating and prosecuting leaders and officials guilty of corruption in Guatemala, including former president Otto Pérez Molina, who is now in prison. Morales’s order to expel Iván Velásquez from his position in the CICIG was almost immediately denied that day by the Constitutional Court. However, although his request was denied, in the following days the president’s approval plummeted as several members of his administration left office, and thousands of protesters took to the streets to demand his resignation. Following the action-packed few days within which Velásquez requested the lifting of the president’s immunity on August 25, then the president’s order to fire Velásquez on the 27, and then the denial of this order that same day, the eyes of the entire country have been on the Guatemalan Congress, waiting for their decision on whether to grant the request to strip Morales of his immunity and continue with the CICIG’s investigation. Despite Guatemala’s deep history of corrupt leaders, the allegations against the sitting president still come as a bit of a shock to the Guatemalan people. Morales, a former TV comedian with no formal political experience, won the presidential election on a platform of anti-corruption, and the slogan “ni corrupto, ni ladrón” (“not corrupt, nor a thief). Therefore, the allegations that Morales himself may be guilty of corruption have triggered disappointment and outrage throughout the population. This disappointment has only been exacerbated by Congress’s decision to not allow further investigation of the President’s corrupt finances; although Guatemala has taken a step forward in fighting corruption with the CICIG, this decision by Congress is one more step backward in this fight. Although this vote stops the possibility of investigating president Morales directly, the investigation will continue into the other parties that may have been involved in this illegal financing of the president’s campaign. The 158-seat Congress of Guatemala, in order to permanently settle the issue, would have required a two-thirds majority decision; however, the decision on the 11th fell one vote short of this two-thirds majority. Therefore, if need be, the question of the President’s immunity could be raised and voted upon again in the future. BBC Mundo, Redacción. 2015. “El Comediante Jimmy Morales Gana Con Claridad Las Elecciones En Guatemala.” 25 October. BBC News. Available here: http://www.bbc.com/mundo/noticias/2015/10/151026_guatemala_jimmy_morales_gana_elecciones_presidenciales_bd [Accessed 31 August 2017]. Lakhani, Nina. 2017. “Crisis Flares in Guatemala over Corruption and Organised Crime.” 27 August. The Guardian. Available here: https://www.theguardian.com/world/2017/aug/27/guatemalan-president-jimmy-morales-order-expel-head-un-body-suspended [Accessed 31 August 2017]. Malkin, Elisabeth. 2017. “Showdown in Guatemala over Investigation of President.” 28 August. The New York Times. Available here: https://www.nytimes.com/2017/08/28/world/americas/guatemala-corruption-morales.html?mcubz=1 [Accessed 31 August 2017]. Al Jazeera. 2017. “Guatemala Top Court Sides with UN Anti-Corruption Unit.” 29 August. Al Jazeera. Available here: http://www.aljazeera.com/news/2017/08/170830023245822.html [Accessed 31 August 2017]. BBC News. 2017. “Guatemala President Jimmy Morales under Fire for UN Expulsion.” 29 August. BBC News. Available here: http://www.bbc.com/news/world-latin-america-41078567 [Accessed 31 August 2017]. Deutsche Welle. 2017. “Guatemala Parliament Votes to Keep Immunity for President Jimmy Morales.” 12 September. Deutsche Welle. Available here: http://www.dw.com/en/guatemala-parliament-votes-to-keep-immunity-for-president-jimmy-morales/a-40457825 [Accessed 12 September 2017]. Malkin, Elisabeth. 2017. “President of Guatemala Wins Vote to Preserve His Immunity.” 12 September. The New York Times. Available here: https://www.nytimes.com/2017/09/12/world/americas/guatemala-morales-immunity-corruption.html [Accessed 12 September 2017]. Al Jazeera. 2017. “Guatemala Congress Rejects Lifting Morales’ Immunity.” 11 September. Al Jazeera. Available here: http://www.aljazeera.com/news/2017/09/guatemala-congress-rejects-lifting-morales-immunity-170912005603670.html [Accessed 12 September 2017].